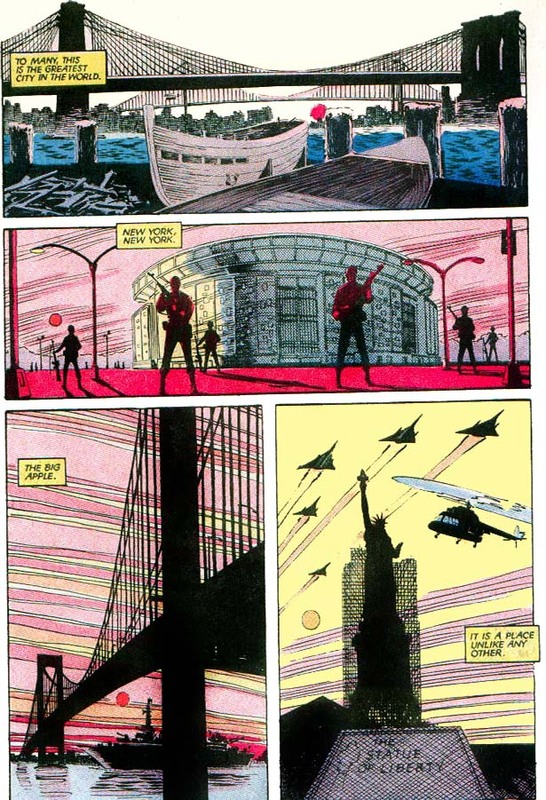 Synopsis: Starting my 9th year of My Marvel Life, we have Uncanny X-Men 190, written by Chris Claremont, with art by John Romita Jnr and Dan Green and opens with a view of New York, but a New York like never seen before. It seems like a sword and sorcery era New York. We get this exposition from a briefing of the NSA by Val Cooper. 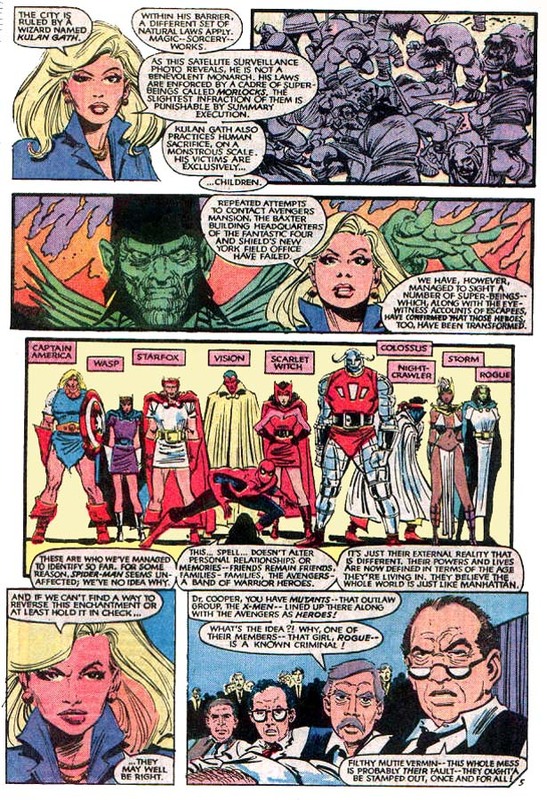 We get some anti-mutant sentiment and a defence of the Mutants’ existence by General ‘Thunderbolt’ Ross. 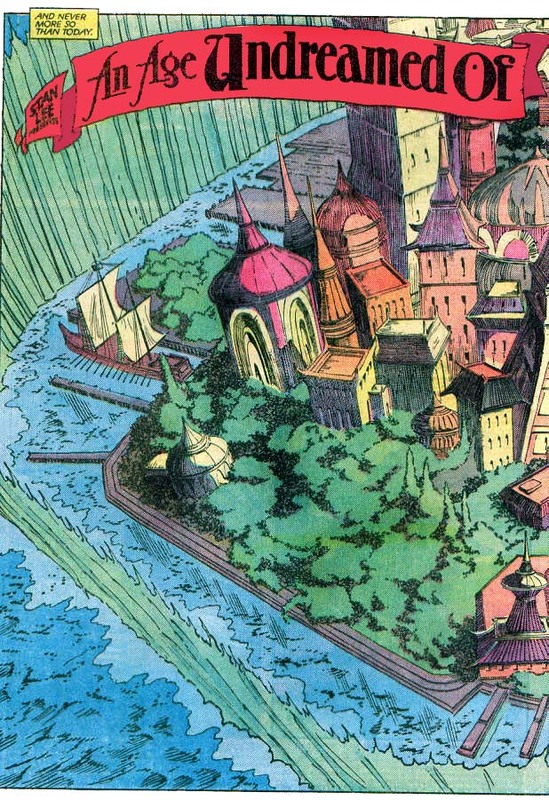 The basics are that a wizard called Kulan Gath has changed the whole city into a city from his Hyborean era (think Conan the Barbarian) and everyone and everything in the city has reverted to match those surroundings and have no idea that it’s been done. Anyone inside the city is affected as soon as they are there, but it’s gone whenever they leave. The only unaffected person in the whole city is Spider-Man. 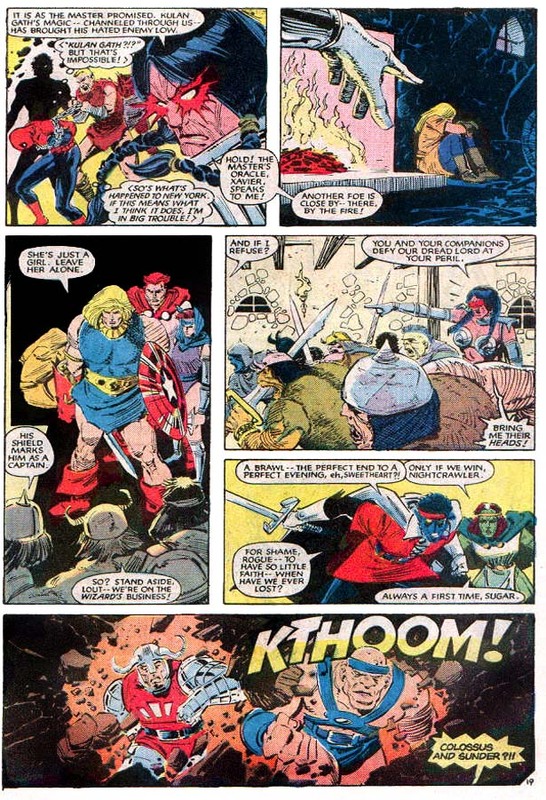 Inside the city limits on a docked ship, Lady Ororo is being arrested by Callisto and Sunder of the Wizard’s guard, who are to arrest Ororo for ‘reasons’. 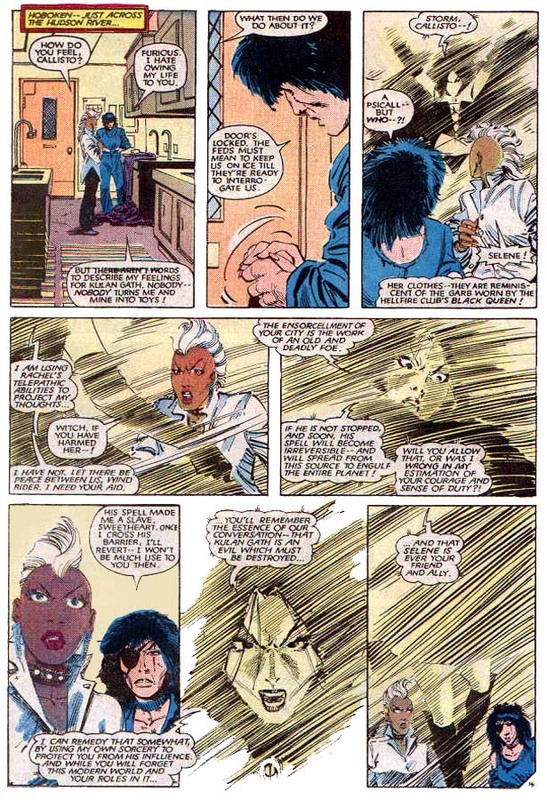 The battle ends with Ororo and Callisto falling into the river, just outside of the city limits and Ororo is Storm of the X-Men again. 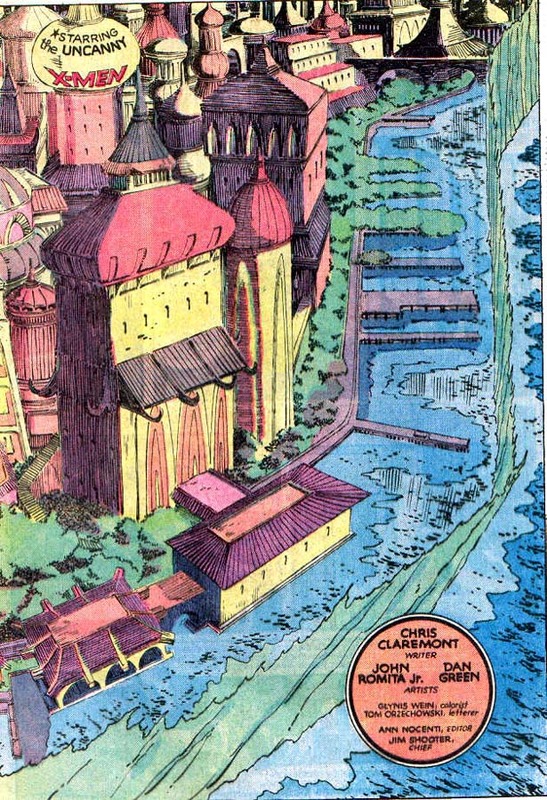 Inside the city, Kulan Gath has used magic to warp Doctor Strange so he can’t speak or use his hands to make magical sigils and has merged Professor Xavier and the morlock known as Caliban into one being under his control. 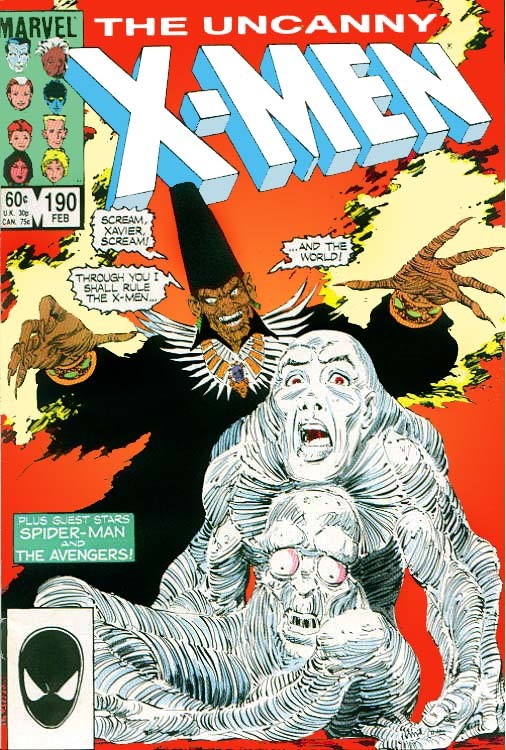 He uses Caliban-X to gather the New Mutants who are brought before him, all fall under his control except for Warlock, who through his more alien nature is able to resist the transformation of New York (Gath refers to it as the ‘Master’ spell) and flees. Also in the city is the mutant sorceress Selene, who recruits a transformed Rachel ‘Phoenix’ Summers and Magma to her side and then using Rachel contacts the freed Storm and Callisto and makes a deal for them to return to New York and take the battle to Kulan Gath. Then we see Spider-Man fleeing dozens of Kulan Gath’s men (including Sunder and Colossus), ending up in a tavern. 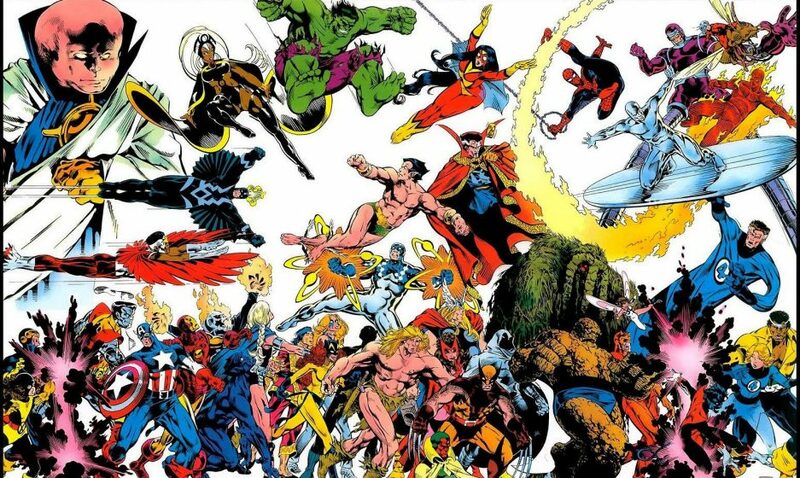 This tavern happens to be one that contains the barbarian world versions of Captain America, the Wasp, Starfox, Nightcrawler and Rogue as well as Ilyana ‘Magik’ Rasputin, who try and fail to prevent Spider-Man’s capture. 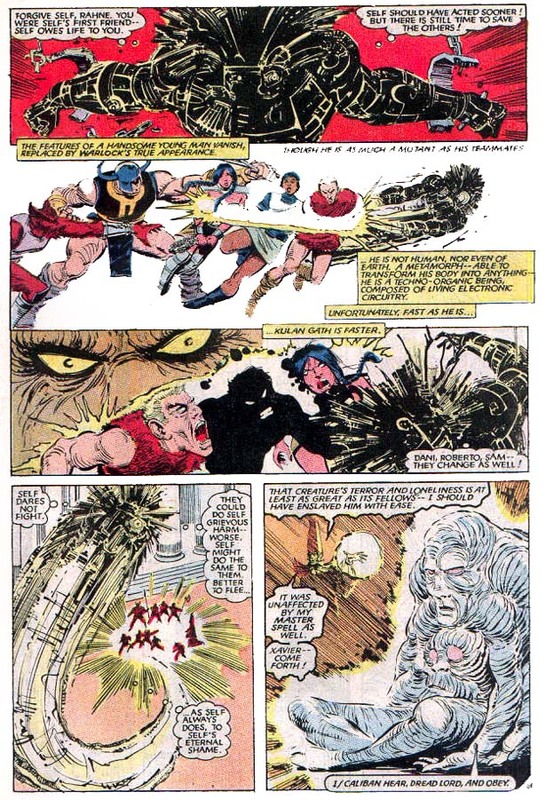 The enslaved New Mutants attack and find themselves facing Captain America and the others, when they also try to capture Ilyana. Then Selene joins the attack along with Magma and Rachel Summers. Kulan Gath shows his face and demands this resistance ends, before taking Selene as his prisoner. 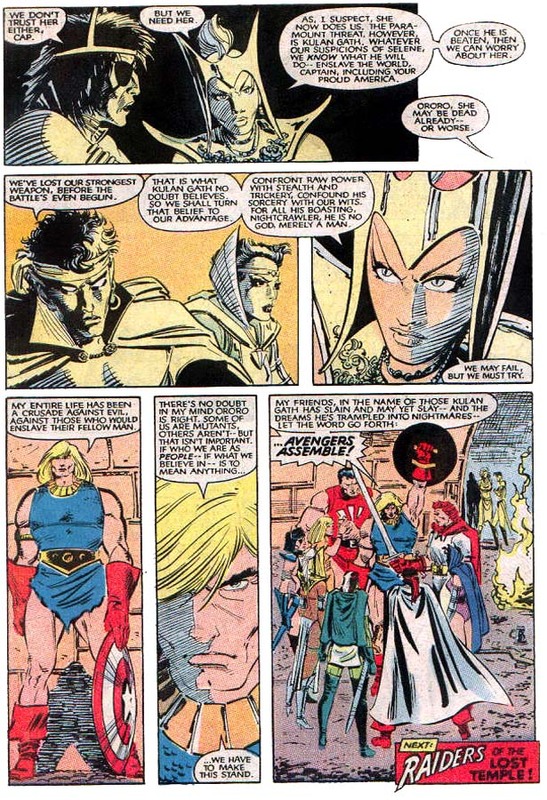 Storm and Callisto return at this point and help the assembled heroes to escape under the city. We then get some speechifying from Captain America and the group decide to battle Kulan Gath and restore freedom to this city. Notes: I liked this story. Simple as that, it showed a fantastic contrast to modern events. There’s no preamble, no prologue, it’s straight into the story. The exposition is perfectly handled, by showing people who aren’t there what is happening, rather than using flashbacks or news footage. The inks and colours don’t benefit Romita Jnr’s pencils, too well, but he does a great job telling the story, which is well put together by a Claremont at the top of his game. The themes of mutant persecution are there as always, but it’s wrapped in this sort of sword and sorcery story that didn’t need to be an X-Men story. 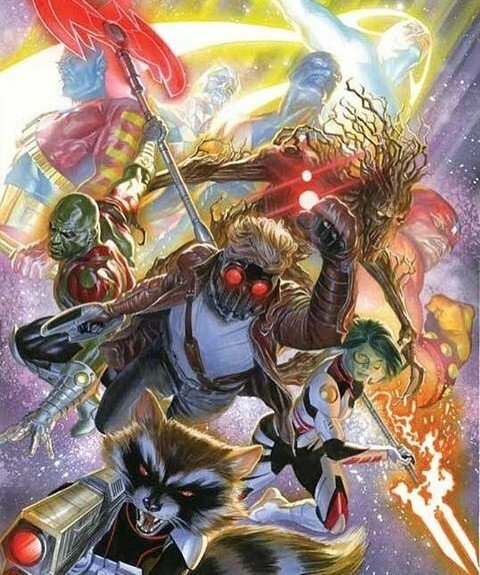 Today this would be a sprawling 30 issue event thing, including prequels, tie-ins and a couple of epilogues, but this was a two part story that was simply enjoyable. Would I have liked to have more depth of this world? Yeah, probably, but Claremont sacrifices it for pace and it’s a fair trade off. This is what serialised comics can do well, rather than go on from event to event, they tell stories that are fun and exciting and a little bit different, after a few months of less than amazing comics, am starting to have more fun doing this.